How long do cats live? How old is the oldest cat? Well, how long do cats live? Some members of the species may be very long lived indeed. The oldest cat recorded by the Guinness Book of World Records was one called Creme Puff, who was 38 when he died, and there are stories of others living even longer lives than this. This is quite unusual though, as an average cat life span is around 15-20 years. 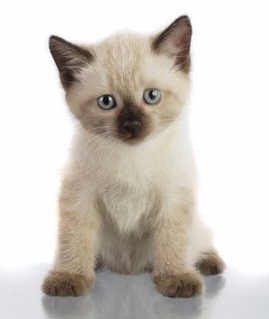 The kitten stage of a cat's life lasts from birth until puberty, which occurs from between six to eight months old. He's then considered a young adult up to the age of six. Middle age lasts from seven till eleven years old. From twelve onwards, a cat is officially considered a senior. Please ... how long do cats live? Do pedigrees live longer than 'moggies'? A cat's breeding can have an influence on how long it lives. Some breeds do live longer than others. In-breeding over the years may have changed this however, as some modern Siamese can be prone to genetic diseases that can considerably shorten a Siamese cat's otherwise long life span. In general, though, healthy Siamese cats can live very long lives. Moggies (mixed breeds), because of their mixed heritage, are generally more robust than pedigree felines and can be expected to live slightly longer than their pedigree counterparts. The tips below on caring for your cat in the best possible way will help him to live a longer life. Regular veterinary checks (at least once-yearly is recommended) will spotlight any health problems which can then be tackled straight away. Feeding your cat with the best food you can afford helps, too. There are cat foods designed for each stage of a cat's life, and giving your cat the food that's right for him will help to keep him kitten-fit as long as you don't overfeed him. Overweight felines face serious health problems as they get older. Exercise can help to keep your cat fit and his weight down. Cats allowed outdoors get enough exercise in their daily lives, but your indoor furry friends should be given toys to play with to help keep them fit. Tie a piece of string to a short pole and dangle it above them, or walk around with the string and get the cat to follow you. Most kitties love chasing string! Keeping your cat indoors may help to give him a longer life, as outdoor cats must learn to deal with traffic, rival cats and other animals, and possible problems like poisoning and disease. So, how long do cats live? Well as you can see, it all depends on many things. But there's following the advice above can help your cat to enjoy a long and healthy life.